This paper presents a study on the Wular Lake which is the largest fresh water tectonic lake of Kashmir Valley, India. One hundred and ninety-six (196) water samples and hundred (100) sediment samples (n = 296) have been collected to assess the weathering and Anthropogenic impact on water and sediment chemistry of the lake. The results showed a significant seasonal variability in average concentration of major ions being highest in summer and spring and lower in winter and autumn seasons. The study revealed that lake water is alkaline in nature characterised by medium total dissolved solids and electrical conductivity. The concentration of the major ion towards the lake central showed a decreasing trend from the shore line. The order of major cations and anions was Ca2+ > Mg2+ > Na+ > K+ and HCO3 − > SO4 2− > Cl−, respectively. The geochemical processes suggested that the chemical composition lake water is mostly influenced by the lithology of the basin (carbonates, silicates and sulphates) which had played a significant role in modifying the hydrogeochemical facies in the form of Ca–HCO3, Mg–HCO3 and hybrid type. Chemical index of alteration values of Wular Lake sediments reflect moderate weathering of the catchment area. Compared to upper continental crust and the post-Archean Shale, the sediments have higher Si, Ti, Mg and Ca contents and lower Al, Fe, Na, K, P, Zn, Pb, Ni, Cu content. Geoaccumulation index (Igeo) and US Environmental Protection Agency sediment quality standards indicated that there is no pollution effect of heavy metals (Zn, Mn, Pb, Ni and Co).The study also suggested that Wular Lake is characterised by both natural and anthropogenic influences. 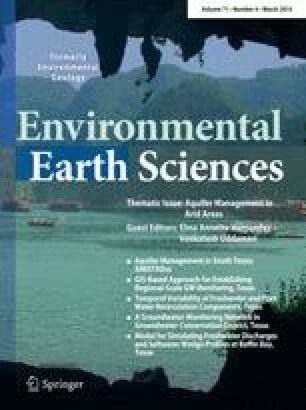 The authors are highly thankful to HOD, Department of Earth Sciences, University of Kashmir and HOD, Department of Environmental Sciences University of Pune, for providing laboratory and other facilities. The authors also express gratitude to the anonymous reviewers whose comments and suggestions improved the quality of this manuscript.